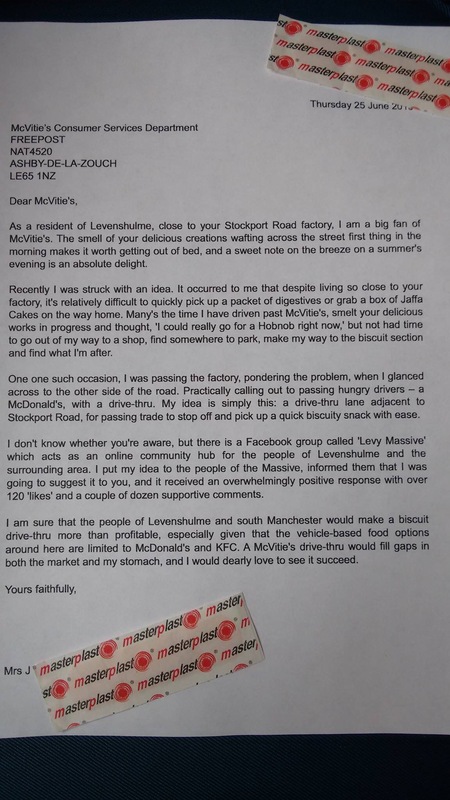 Levenshulme often smells of warm biscuits thanks to the McVities factory on Stockport Road. That satisfies most people’s biscuity cravings. But it wasn’t enough for Josie Stripe who wrote to McVities proposing a drive-thru. The whole of Levenshulme, if not Manchester, is behind you, Josie. This entry was posted in business, community, facilities, food and drink, manchester, shopping by Jeremy Hoad. Bookmark the permalink. The whole of Levenshulme? Really?